Several weeks ago a termite inspector gave us the bad news: we have dry wood termites in our home. Option 1: Spot treatment. A company could spot treat the termites by injecting “Orange Oil” into the areas where there has been termite activity. The Orange Oil is non-toxic and treatment can be done quickly without having to leave the house. Option 2: Tenting. A company could tent the entire house and fill it with Vicane gas. This option would mean evacuating the house for 2+ days and either double bagging or taking with us a bunch of things including all the food in our refrigerator, freezer, and pantry. The two options are relatively close in cost, so spot treatment certainly sounds like an appealing option. But it turns out that termites have to come in contact with the orange oil for it to kill them. Often, the termite guys can’t see evidence of all the places where termites are, and so a year or two later people often find new evidence of termites. With that in mind the decision seemed to be a choice between the spot treatment that is easier but might not work and tenting which would be a pain but would definitely and completely solve the problem. When you tent your house everyone in the neighborhood knows it. Some people might think we’re bad housekeepers. They might think less of us. It could be embarrassing. Couples struggling in their marriage often refuse to go to a counselor because they’re afraid people will find out they’re having marriage problems. People up to their ears in debt often refuse to go to a financial manager or debt relief counselor out of embarrassment. People choose to continue wrestling with addiction on their own rather than go to rehab or a step program. People who believe in God and the power of prayer are afraid to tell close friends, their small group leader or their pastor what they really need prayer for most. 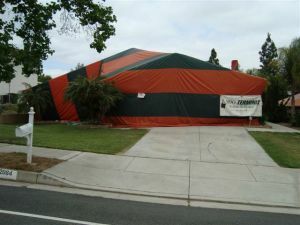 After discussing the matter, Jennifer and I opted for the more public but more effective option to have our house tented. In fact, at this moment our house is filled with toxic gas and I’m writing this from my parents’ kitchen table. What problem in your life have you been trying to “spot treat” because you’re afraid of what people will think if you were to choose the best but most visible option? You only live once. A year from now do you want to still be struggling with that? Or would you rather go through the short term pain and embarrassment and a year from now have it all be in the past?